Remember those pest-looking Decepticons in the G1? 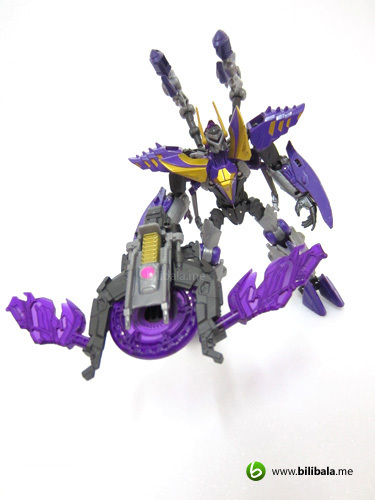 Well, they are the Insecticons which comprise of the 3: Kickback, Shrapnel and Bombshell. 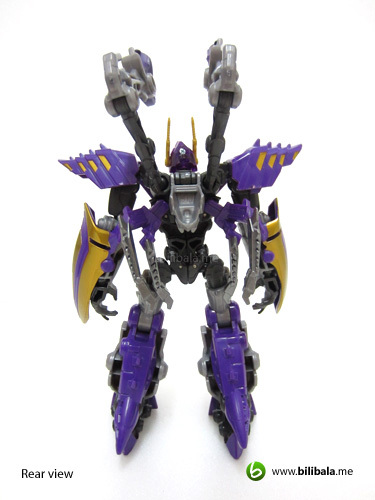 The only insect robots that first make their appearance in Transformers cartoons. 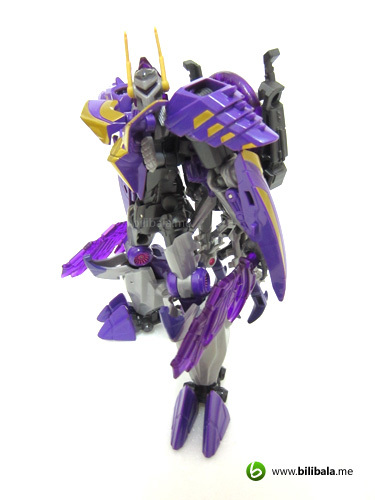 This time around, Hasbro has started off making an reincarnation of Kickback in a cool and menacing form which you will definitely give a second glance to him.Well, not to be surprised, the 2nd to followed is actually Hardshell (aka Bombshell) which will appear in Cyberverse commander of Transformer Prime Toy. 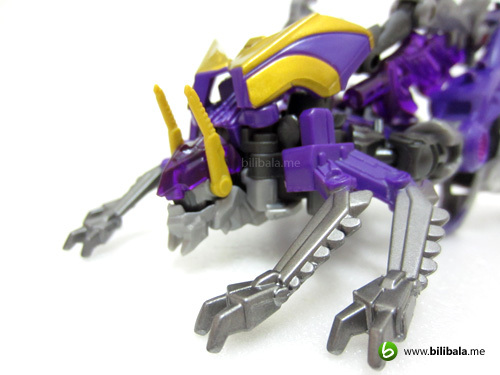 Personally, I don’t really much like beastie transformers. 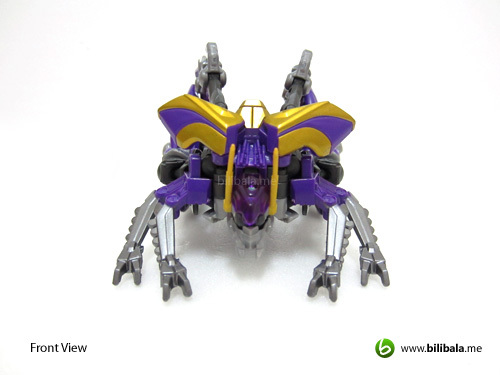 However, there’s exceptional case for insect infused Transformers which spark my interest in owning one. It is quite interesting to see how they blend tiny everyday insect into a bigger and deadly robots and the best part of it? Transforming them. Read on with this new edition of Kickback and get ready to be kicked back! 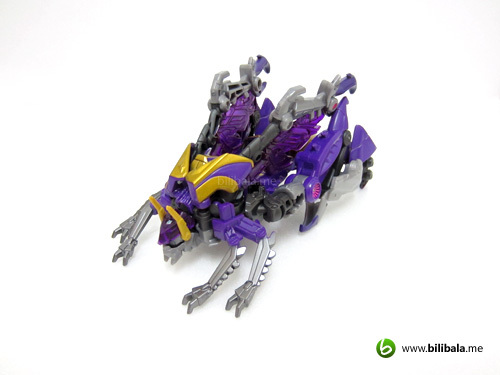 True to it’s form, Kickback remains as a grasshopper, well, not your typical green grasshopper that is. 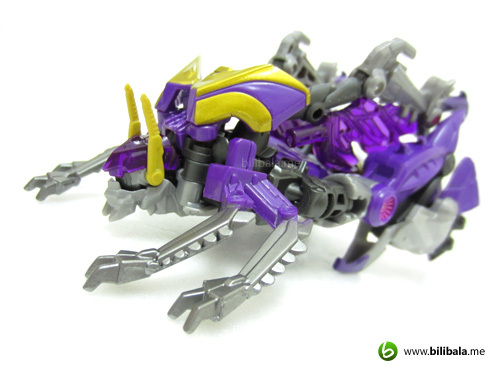 It comes in a sleek purplish-yellow Cybertronian form. 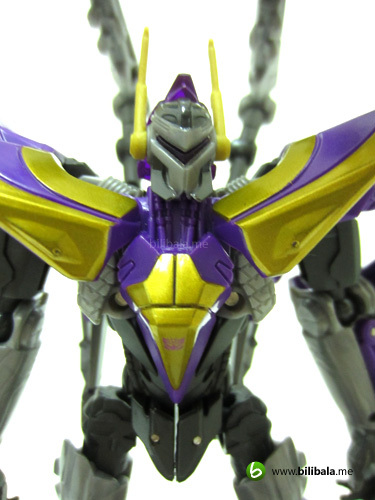 The overall color scheme follows closely as to the G1 with dominant of purple/grey and a touch of golden yellow. I am impressed by the quality of the color being imposed on such deluxe class: no obvious paint chip, smooth metallic colors here and there. And what’s more, it comes with tons of details and every bit of him is nicely done. Most of the plastic materials used for him is smooth shinning plastic despite it being a medium cost deluxe. Well worth of the price I must say. The figure also comes with 3 pairs of extra limbs which being 2 pairs of not movable metalic silver painted front limbs. Purely aesthetic. 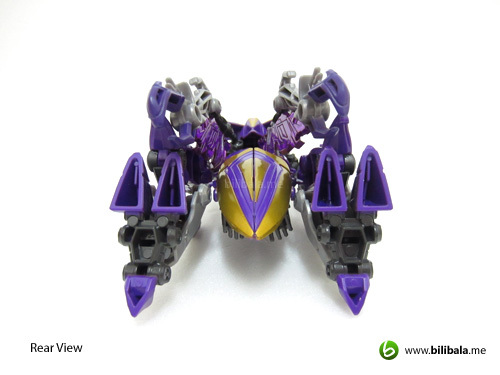 I really like how the headpiece is designed with the inverted usage of the light piping from it’s robot head. Very nicely done. 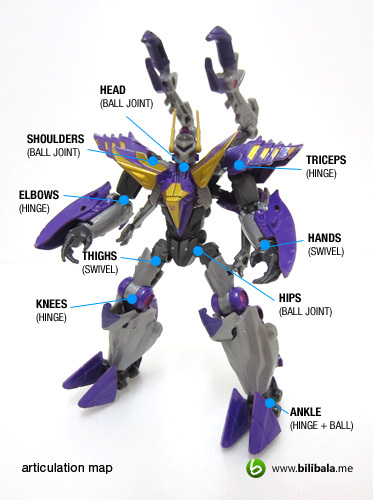 Details are top notch and carefully painted: for instance, the pink color turbine like knee joints. 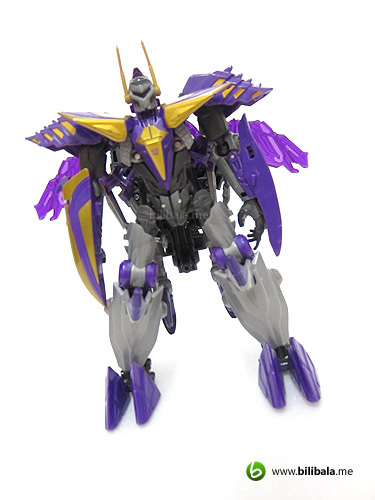 I like how the wings are actually made of his translucent purple plastic sword. 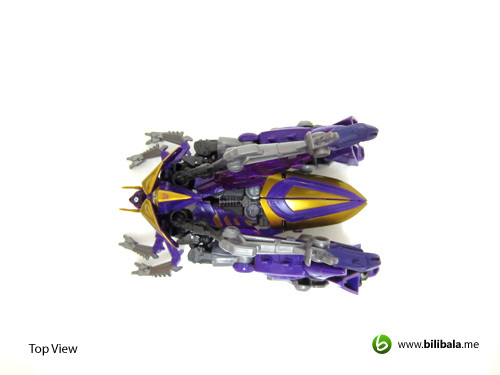 However, there’s a problem with this figure in alt mode. The abdomen of the insect can’t really join well and easily be separated apart. I have applied some transparent nail color in order to make the connection more secure. Minor issue anyhow. From top view, it shows more of the complexity of it’s details. Notice the gap of the abdomen which exhibits the loosely connected parts. 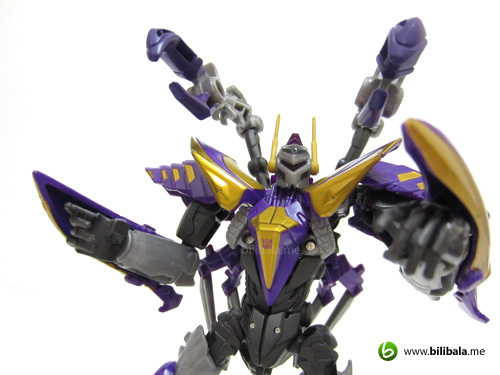 First impression on Kickback: another brother of Vehicon tribe? 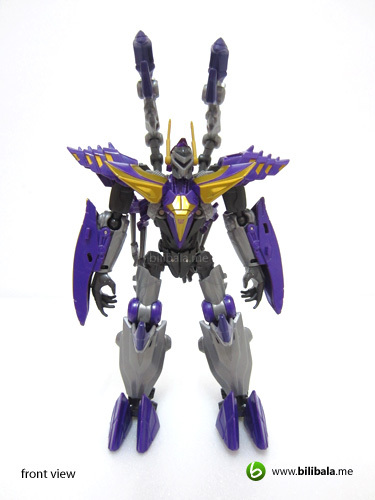 He does have a similar head sculpt compared to the prime Vehicon. 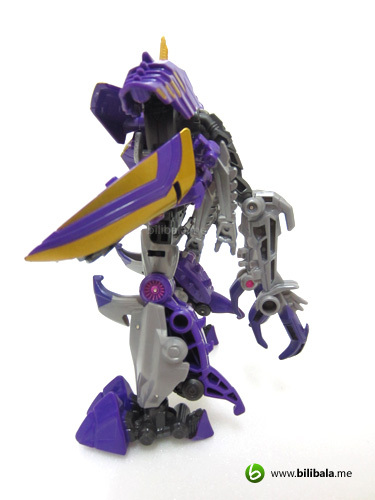 Well, of course, he has more advantages over others, the extra menace looking articulated claws that is. 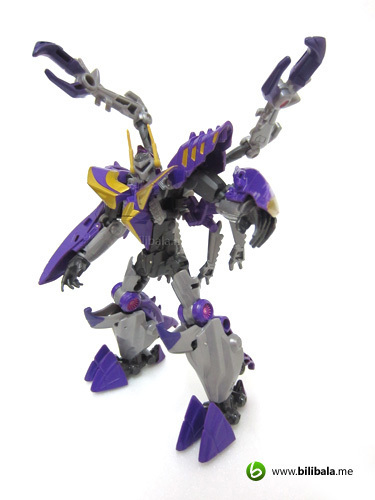 Somehow, he also resemblances a samurai looking vehicon, doesn’t him? Massive shoulder and chest pads which gives away the look of being a solid looking samurai. There is no heavy back kibble to add weight to the back. Overall weight to body proportion is nicely done and he can really stand sturdily on ground. Not to mention, he has a massive feet to support the entire body weight. 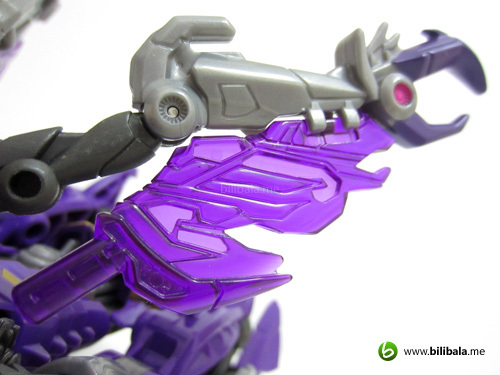 If you feel the extra claw is a bit too overwhelming, you can always flip them downwards to “hide” the claw and this actually opens up the access for you to slot in the weapon (more details in the gimmick section below). A closed up look at the head sculpt. The 2 pointy antennas are actually made of soft plastic which you can bend easily. Child safety issue again. The eye of the figure is being lighted up by light piping half of the size of its head (from side). 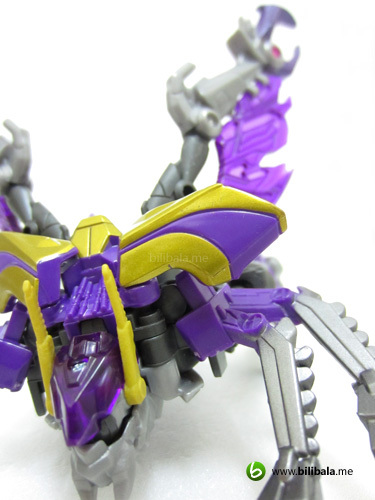 This light piping will become the head of the insect after transformation. 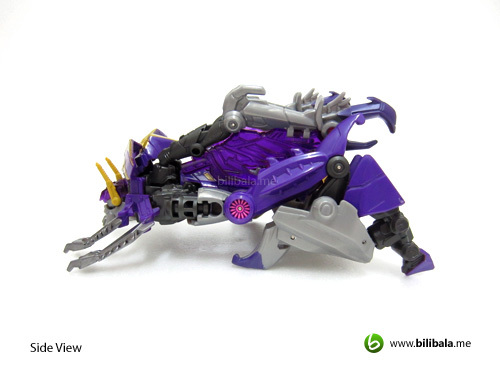 There’s a small Decepticon insignia being imprinted on the lower chest. From the picture, you can notice how shinning the yellow paint over the smooth plastic. 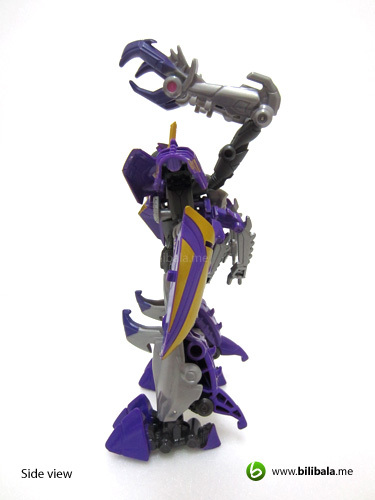 Despite being a deluxe, he does have tons of articulations which allow various pose-ability. Transformation is really interesting and considered it difficult for the first transformation. 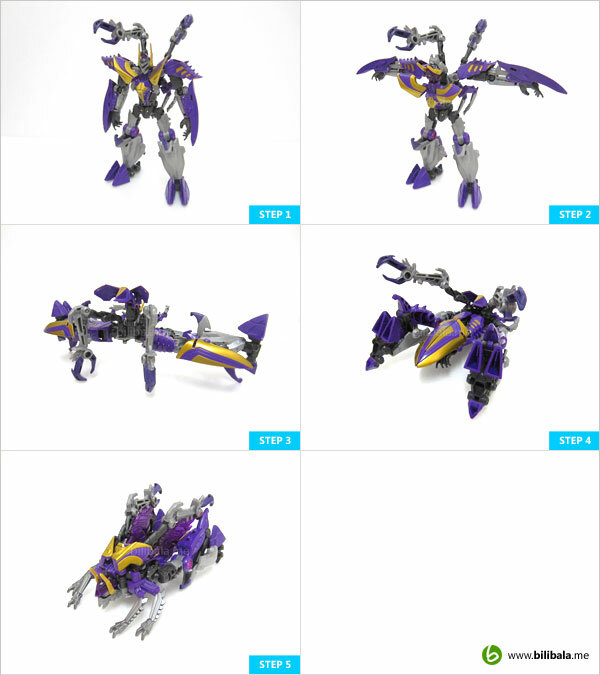 Spent almost like 45 min just to figure out how the pieces are to be transformed. 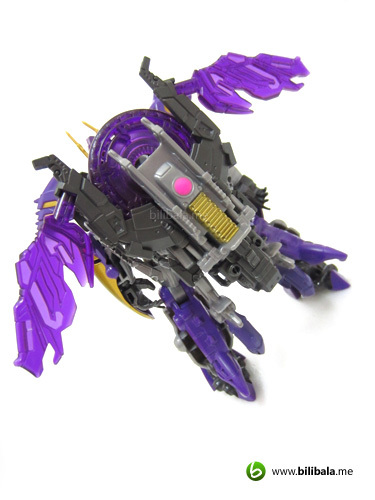 I must say the transformation involves completely split out of certain parts and rejoining them together again. Very intrigue and involving. 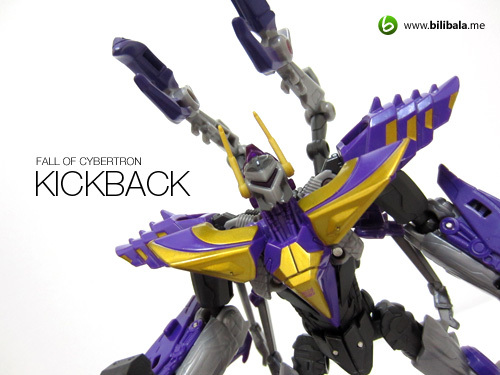 Of all the figures in Fall of Cybertron wave 3, Kickback is the must have! Great mold, great colors and great pose ability sums it all up. Built quality is definitely better than a lot of deluxes around and definitely no hollowness in both modes. 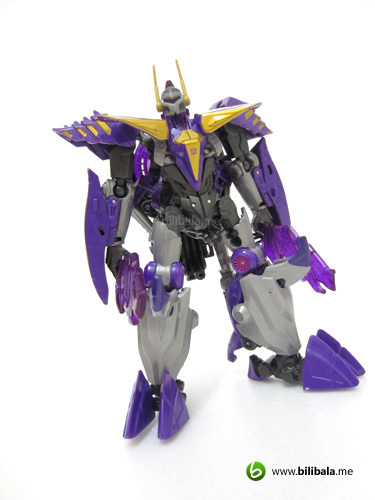 What I like – Good quality in color; solid built with good plastic quality; translucent plastic used in some parts; great transformation despite deluxe; great pose ability. 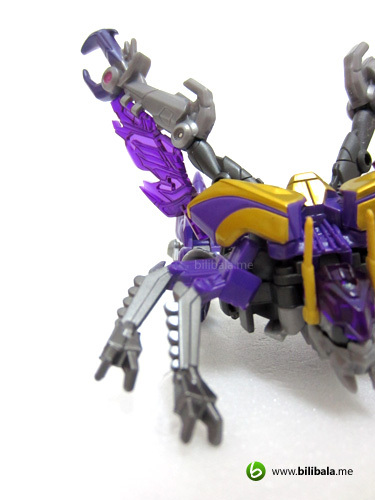 What I dislike?– Abdomen socket/joints doesn’t work well; no extra articulation for the tiny insect limb. Good luck in finding it as it is released as a short packed figure for the wave 3. 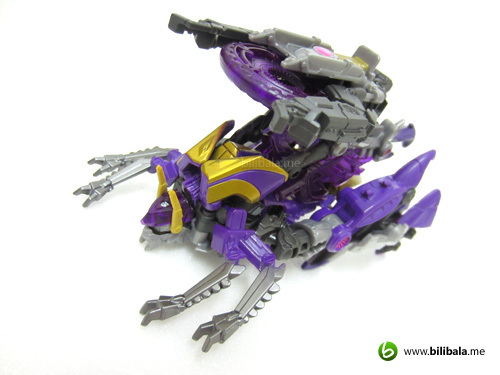 Let’s just hope it will pop up more in wave 4 or wave 5 of FOC.